The first time you go skydiving can be a nerve-wracking experience, especially if you don't know what you're getting into. While it may seem scary at first, skydiving is an activity that most people will love. 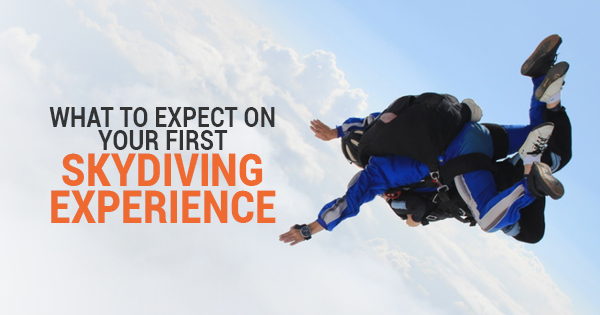 If you're a first time jumper, here's what you can expect before you visit a skydiving center. Even regular skydivers rarely jump off the plane or helicopter alone. Tandem skydiving means that you'll be assisted when you jump into the air by a trained professional. Your skydiving location should be certified to perform jumpy by the United States Parachute Association. The skydiving instructor will be strapped to your back so you get a full view of the world below you as you step out onto the air. You'll be in communication with the instructor the whole time via the latest tech in radio equipment. Your instructor will snap some photos of the two of you in the air to preserve your experience in a tangible way. Your family and friends can also snag a few shots of you coming down to earth when they wait in the designated viewing areas available by the skydiving center. Even though you'll fall from heights of around 13,000 feet, you'll only be in free fall for around 60 seconds. The rest of your time -- give or take about five minutes -- will be spent drifting to the ground with your parachute. Unless you're training to become a skydiving instructor yourself, your training for a tandem parachute jump will only take around five minutes. Because you're with a trained instructor, your safety is guaranteed throughout the jump process. Jumping into the air is an exhilarating feeling, but it can be scary for first time jumpers. If you're worried about your first free fall, call your local skydiving center for more information. Skydiving is a fun experience for any adult that wants to experience a free fall. While it might seem scary at first, your local skydiving center will give you all the materials you need to have a successful jump. So, what are you waiting for? Call Jump Florida Skydiving today!